On the left, Colony 1. 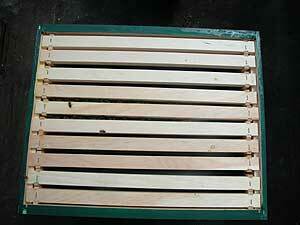 Most of the frames were empty of bees and comb: three had been somewhat drawn, one on both sides. 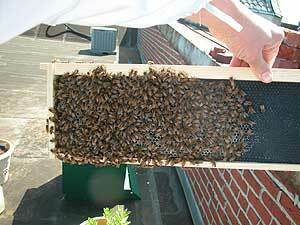 There were lots of bees on these combs, and also in the feeder. BUT... 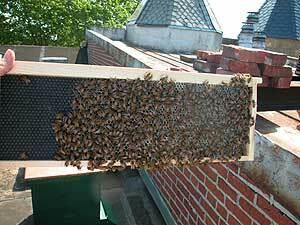 Colony 2, when opened, was crowded with comb on all but one frame (sorry, the camera apparently did not get the overview shot I tried for). 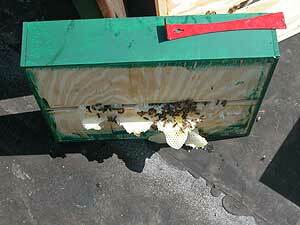 There was brace comb in the passage to the feeder, because the bees wanted more space to build in an upward direction. One of the busy frames from Colony 1 is on the left hand side (notice the naked thumb: I decided getting stung was better than mashing bees in those awkward gloves). 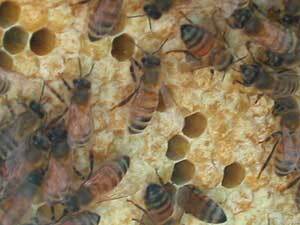 The comb is all open, and the eggs I could see in the hi res version were quite early. I saw no pollen cups. On the right, from Colony 2 (by way of comparison) what I think is bee bread (a combination of pollen and nectar in a capped cup, used to feed brood). I am going to pester the poormaster beekeepers again to find out if maybe this is CAPPED BROOD, which might mean that those empty holes mean new hatched bees. Two more frame shots from Colony 1, also for beekeeper reference. I have a terrible feeling about this. This is the feeder (for sugar syrup from Colony 2. The bees drained it dry, and then started moving in! 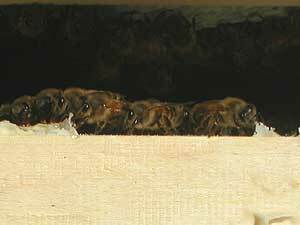 The picture on the right is a close up from before I cut the comb off (and left the pieces for them on top of the frames below –hope that was a good thing to do – it looked FULL of honey!) The red tool is what I used for the dirty business. 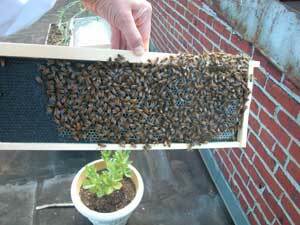 Inside Colony 2, this is a picture of worker bees taken from above. Is it wrong to love the way they look? 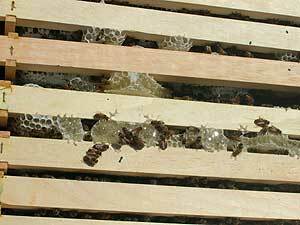 The girls are gorging themselves on honey, a reaction to the cool smoke I blew at them when opening their hive. 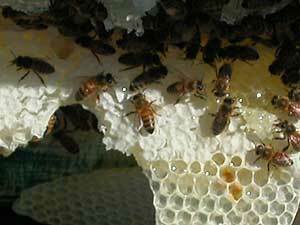 Bees try to eat up the honey when they think there is a fire, in order to fly away with it and make another colony if necessary. It gives them better things to do than attack the beekeeper or get in the way of Important Business, as well. 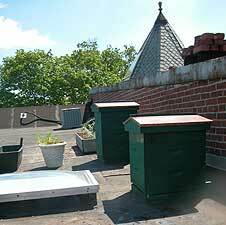 On the right you can see that Colony 2 has received a new upper floor to allow the bees to expand. Colony 1, sadly, has no need.